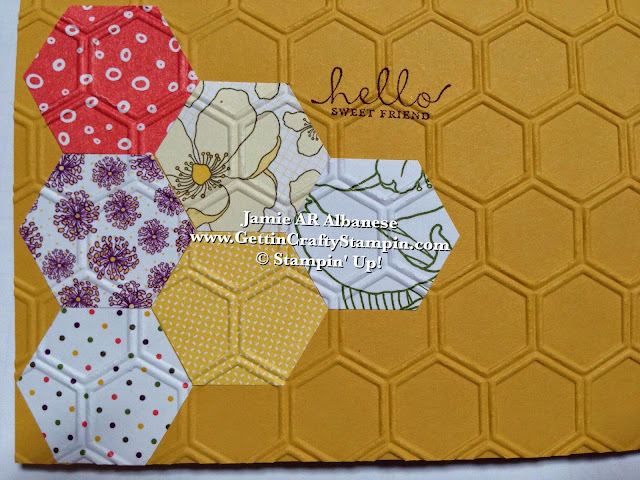 Send a honey of a sweet card with this Hello Honey card stock, honeycomb embossed hand-stamped card. Creating a card that is clean, sweet and simple is fun. Take it up a notch when you add texture and pattern using our Big Shot Die-Cutting Machine. When products coordinate - you can quickly create a sweet card that is sure to deliver smiles! I LOVE when stamps and punches coordinate - top that off with a similar pattern to add texture to a project and you have me giddy! Add a fabulous collection of rich papers, coordinating colors and stunning images - you could knock me over with a feather! I LOVE IT!! Here the Park Lane Designer Series Paper is rich in color and pattern. The pages are double sided so you can punch twice and flip it over for double the pleasure! Adhere the awesome Park Lane Designer Series Paper to the card stock front with SNAIL adhesive. 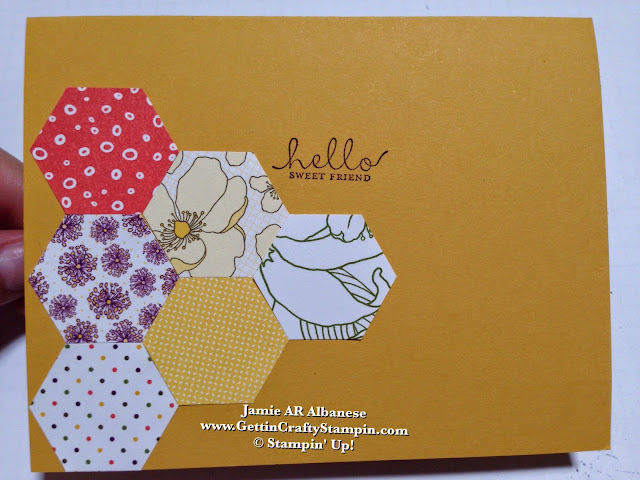 Run the front of the card in the Honeycomb Embossing Folder in the Big Shot Die-Cutting/Embossing Machine. This will make reinforce the adhesive due to the full contact. 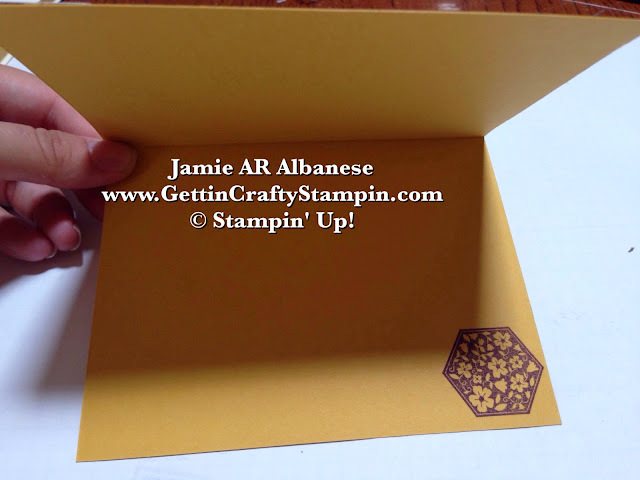 TOOL TIP TUESDAY: In order to emboss a card front like this, you need to start with a cut and SCORED card stock. This will give you a guide of where to place your embossing folder. On a project with a full embossed front of your card expect the image to shrink your card front slightly. This is to be expected because you are raising a good portion of it. The embossing folders are a longer on one side - so I actually trim it down so that I can use it to feed either way. Just don't cut it into the pattern and leave a small seam after the pattern. Pattern, Texture, Rich Colors... oh, be still my heart. Add a little something extra to the inside! The Six Sided Sampler stamp set gives you many options. Here the floral rubber stamped accent is a fun addition to this hand-stamped card. Crafting a sweet card is easy to do with great coordinating tools, papers, inks, textures, etc. Create a pretty hand-stamped card that is sweet, rich and it won't add to your calorie count - lol! Here you can send the card just as is or add a fun coordinated texture. No matter how you create it, this sweet hand-crafted card is sure to deliver some smiles!